A Blokart is a 3 wheeled kart or type of land yacht which uses a sail, similar to those found on small dinghies, to provide traction. Blokart Sailing is a relatively new sport which is becoming more and more popular, mainly due to its easy accessibility. A Blokart packs away into a bag that will easily fit into the boot of a car and is very easy to set up and use. The small size means that they can also be easily transported on aeroplanes to take part in international events or just for fun on holiday. Almost anyone and everyone can participate! 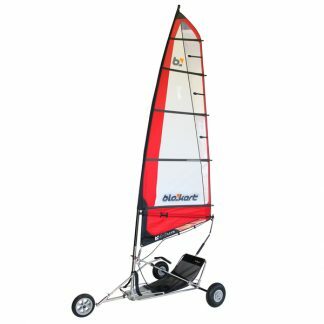 Blokart sailing appeals to people from 8 to 80. The Blokart is controlled using the hands only, meaning that a person’s size and mobility need not stop them enjoying the sport; people with paraplegia, prosthetic limbs and many other medical conditions can compete equally with able-bodied sailors. Blokarts are also very safe, providing the right protection measures are worn. It is incredibly easy to learn to sail. There are 4 sail sizes; 5.5m, 4m, 3m and 2m to suit a range of conditions; All of the sails will propel you at speeds up to twice the actual wind speed.